Fluted surface in front of Brúarjökull. Downwasting ice margin, with dirt cones, in background. Photo: Ó. Ingólfsson 2004. Fast flowing ice or palaeo-ice streams have recently been identified as one of the most important controls on the configuration and stability of former ice sheets. The problem, however, is the lack of contemporary analogues for land based ice streams that is necessary to understand their glacio-dynamic behaviour. Despite this, a certain type of glaciers (surging glaciers) that momentarily reaches fast ice flow actually provides an imprint of sediments, landforms and landform assemblages that resembles the situation related to ice streams. The overall aim of the Brúarjökull project is directed towards the study of depositional environments at a contemporary surging glacier. This includes the development of glacial landscapes and associated sediments. Thus, it embraces the interaction between climate-processes-sediments and landforms over time and space involving glaciological, geomorphological, sedimentological and glacial geological disciplines. The results will serve as reference work and inspiration for geomorphological and geological investigations in areas suspected to be influenced by palaeo-ice streams. Reconnaissance work was carried out during the 2003 field season, continued field work was in the Brúarjökull glacier forefield area in 2004, and is planned for the 2005 summer, with an international research team comprising up to 10 members. (1) Which sedimentological and geomorphological properties are diagnostic for sediments deposited in different environments at Brúarjökull and how are they related to glacio-dynamic and climatic changes? Dirty ice at Brúarjökull terminus. Photo: Ó. Ingólfsson, 2004. Supraglacial environment. 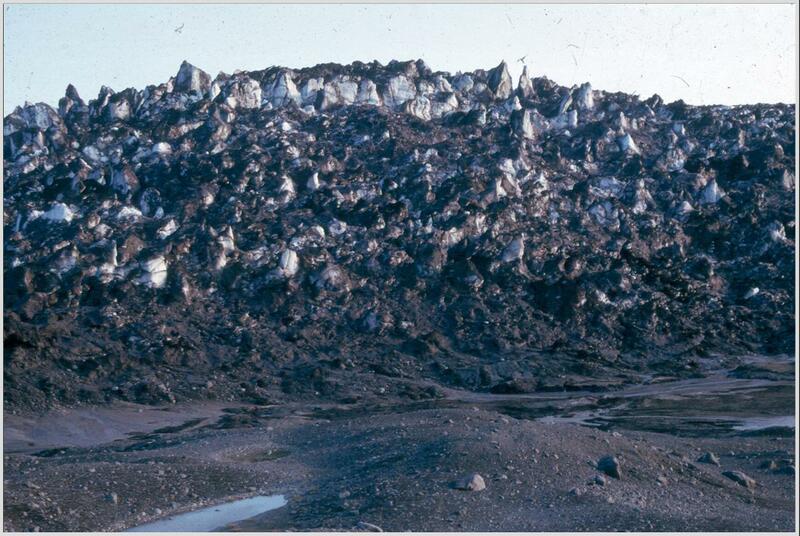 During each surge of Brúarjökull huge quantities of debris were transported towards the ice-margin, perhaps as a result of compressional deformation accompanied by extensive thrusting and folding that concentrated basal ice and debris englacially (Clapperton 1975, Sharp 1988a). When the glacier stagnated, collapsed, and finally disintegrated this material began to emerge on top of ice-cores leading to the formation of dead-ice moraines. 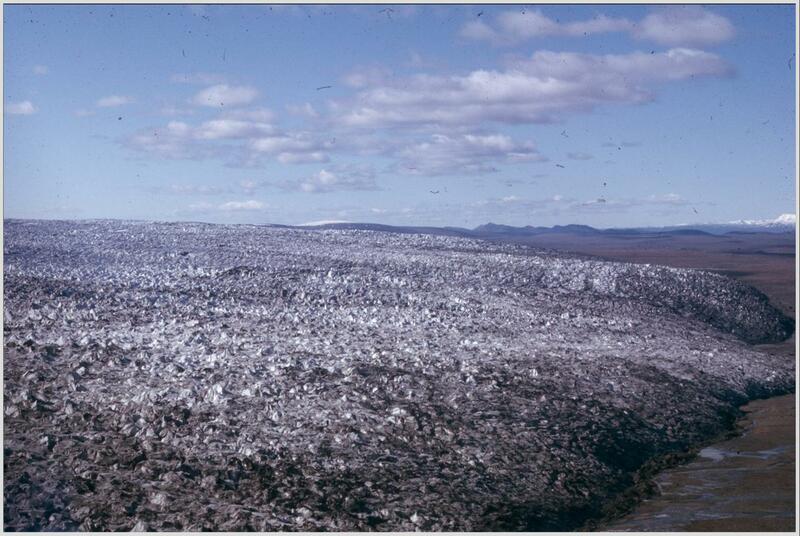 Since these debris-covered ice-cores might be overridden and reincorporated into subsequent surges and are prominent features in the apparent landscape, several important issues are raised: What is the origin of the source material involved in the formation of ice-cored moraines? How long will buried ice persist under the current climate at Brúarjökull and what are the relationships between processes, sediments, and landforms? Todtmann (1952) recognized ice-cored moraines resulting from the 1890 surge and our interpretation of recent aerial photographs and fieldwork 2003 and 2004 has reveal similar features from the 1964 surge. This means that information on the progression of de-icing and development of ice-cored moraines can be achieved through investigation of areas with ice-cored features and dead-ice moraine with different ages mirroring different stages of melting. Furthermore, major processes of ice melting can be identified and quantified under well-known climatic conditions, including the rate of melting and the contributions related to either temperature or precipitation. Coupled to sediment properties this, in turn, will facilitate the interpretation of the climatic signal of dead-ice moraines from formerly glaciated areas (Kjær and Krüger 2001). Subglacial environment. Much attention has been focused on understanding the subglacial system and the deposition of ground moraines (Hart and Rose 2001). 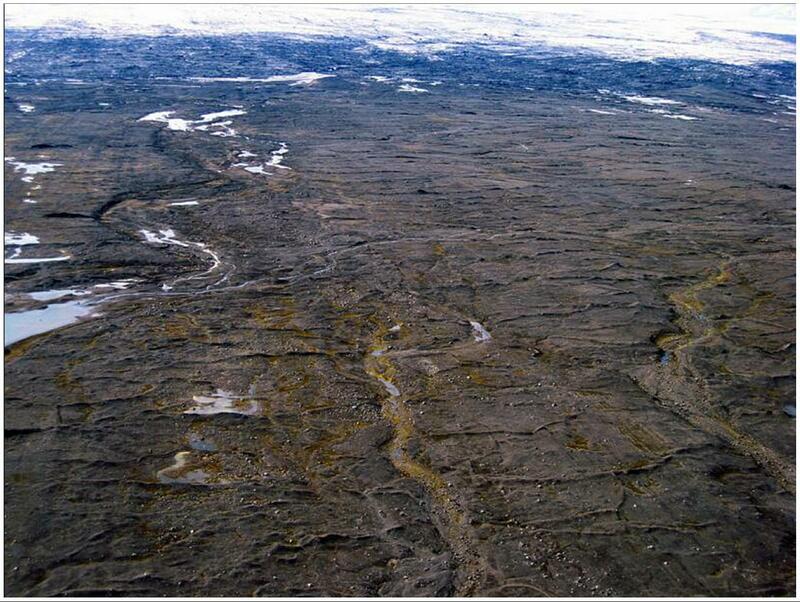 By far the most extensive type of glacial landforms and associated sediments (tills) are those of subglacial origin. Recent research has shown that the spatial distribution of till sheets are highly sensitive to any change in the subglacial drainage pattern reflecting the type of substratum and the pre-advance topography (Kjær et al. 2003a). Previous descriptions show that a till bed was deposited beneath each Brúarjökull surge (Hoppe 1953; Todtmann 1960). Surprisingly, little sedimentological information is available on subglacial deposits associated with surge-type glaciers (Sharp 1985, 1988; Hambrey and Huddart 1995). Some basic questions need to be answered: (i) how were subglacial landforms produced during a surge phase and what are their relative age relationships? (ii) What causes thickness variation of till over distance and how is this related to depositional processes and deformation? It is, therefore, essential to carry out detailed sedimentological investigations, including descriptions of sediment characteristics such as lithology, structures, fracture patterns, directional elements and clast-morphological properties in these type of landscapes. Extremely dirty ice margin of Brúarjökull merges with fluted and muddy proglacial area. Photo: Ó. Ingólfsson, 2004. Ice-marginal environment. Currently, Brúarjökull is retreating with a rate roughly estimated to 108 m/yr as indicated by ice-marginal positions on aerial photographs from 1964, 1982 and 1993. Knudsen (1995) concluded that little frontal movement occurs during the general recession inferred from the absence of annual moraines. However, knowledge on the frontal behaviour of Brúarjökull between surges is lacking, including how the ice-front retreat is balanced with changes in temperature and precipitation. Furthermore, analyses on annual fluctuations related to short-term variations in the summer temperature and winter precipitation are not available. We therefore want to explore how the present-day retreat situation interacts with climate and modifies the ground moraine that is successively exposed in front of Brúarjökull. When Brúarjökull surged, large ice-marginal moraines which can be traced over many kilometers, were produced in front of the glacier. Todtmann (1952, 1955) identified two types of ice-marginal moraine; ‘stauchendmoräne’ and ‘blockendmoräne’ which are equivalent to push and probably dump moraines in modern terminology. Push moraines are the result of proglacial thrusting and folding of material, whereas, dump moraine might have resulted from material avalanching down a steep ice-front (Krüger et al., 2003a), although the specific processes at Brúarjökull are unknown. Since these features are not randomly distributed in front of the glacier, it is important to know what controls the distribution of ice-marginal moraines. It is also desirable to improve the understanding of morphology, internal structures and textural composition of these ridges in order to unravel how the different mechanisms of formation are mutually related? Collapsed sandur field, deposited on dead ice, in front of Brúarjökull. Photo: Ó. Ingólfsson, 2004. Proglacial environment. Proglacial sediments are an integrated part of glacial landscapes including various meltwater produced landforms with different morphological expressions. This leads to the following question: Which proglacial deposits appear beyond Brúarjökull and what are their architecture, style of sedimentation and deformation? During the surge in 1964 a large part of the forefield was flooded by a sheet of meltwater (Thorarinsson 1969; Knudsen 1995). Did this leave any imprint on the forefield? The pushed and stacked 1890 end moraine of Brúarjökull. Photo: Ó. Ingólfsson, 2004. (2) How are the temporary fluctuations (surges) of Brúarjökull with repetitive deposition of glacial sediments reflected in the present-day morphology and internal architecture of the forefield? Most Pleistocene glacial landscapes have a complex internal architecture due to several transgressions by ice often from different directions (Boyce and Eyles 2000, Houmark-Nielsen 1987). It is evident that knowledge of the stratigraphy is necessary in order to confidently reconstruct the development of fossil landscapes. This also applies for landscapes at contemporary glaciers such as Brúarjökull, where the glacier fluctuations in 1810, 1890 and 1964 deposited three distinct stratigraphic units including various landforms. In the literature about contemporary glaciers only limited information is available on the stratigraphical and geomorphological effect of repetitive ice advances over the same area (Krüger 1994). Therefore it is crucial to study the lithostratigraphy and geomorphology in the forefield at Brúarjökull in order to establish a three-dimensional sedimentological model based on the superposition of several generations of landforms (Evans et al. 1999). From aerial photographs and our field work it is clear that older landforms are preserved beneath the present-day landscape and influences the relief of the topography, e.g. ice-marginal moraines from 1810 buried under the sediments associated with the 1890 advance. The final product of the landscape might become rather complex as time-transgressive assemblages of landforms are superimposed on each other. Hummocky moraine, part of the the 1890 Brúarjökull end moraine complex. Photo: Ó. Ingólfsson, 2004. (3) What controls the surge dynamics of Brúarjökull? The lateral changes reflected in the spatial distribution of landform assemblages are closely linked to the dynamic behaviour of Brúarjökull. Therefore it is important to understand large-scale development in ice dynamics linked to the landscape evolution. Underlying this is the importance of understanding the factors controlling the surging behaviour of the glacier. Usually the complex mechanisms related to surge events are studied beneath or exclusively on the glacier using costly geophysical instrumentation (Fischer and Clarke 2001). We, however, will try to gain more knowledge through a combined glaciological-geological approach using satellite images, aerial photograph techniques, glaciological methods and sedimentological studies. This involves matching modern mass balance data, changes in ice-flow patterns and drainage paths in front of the glacier with the geological record. Lakes in dead ice landscape, 1890 end moraine complex. Campsite in background. Photo: Ó. Ingólfsson, 2004. Lake sediments constitute the only continuous archives in the area that can register both local and regional environmental changes, including tephra fall-outs. The area is abundant in lakes and the strategy is to core at least three different lakes of varying settings: (i) one should be connected, through influence of glacial melt water, with the present day glacier as well as with the large surge events, which means that it should be a major sedimentation basin within the main extraglacial fluvial system, (ii) one lake should only be connected to a glacial melt water system during surges, and (iii) one basin should be without direct contact to the glacial system, but register the regional environmental and climate changes, including local and regional tephras. We expect that annual rhythmites (varves) will be deposited during the glacial influences, which means that local chronologies can be established, while the non-rhythmic sediments will be dated with 210Pb, 14C and Ce137. The sediments will be analysed with a set of climate proxy variables, including detailed analyses of the glacio-lacustrine rhythmites. Thus it will be possible to detect general melt-water flux changes, glacial advances, and their relation to regional climatic changes as registered in the non-glacial sediments and from local instrumental/historic records. This will allow us to analyse the role of local climate, volcanic activity and the more large scale atmospheric circulation, e.g. the North Atlantic Oscillation (NAO) as triggers for glacial variations, possibly including surge events. View across the Brúarjökull forefield at Kringilsárrani, towards the glacier. Photo: K. Kjær, 2003. Succeeding almost two decades of intense research on what has been characterized as a paradigm shift in glacial geology, the concept of subglacial deforming beds has recently been progressed by an increasingly interest in palaeo-ice streams. Still, subglacial deformation seems to have an important role in determining the dynamics of glaciers, but at a more subordinate level in the glacial system (Boulton 1986; Boulton and Hindmarsh 1987; Clarke 1987; van der Meer 1993; Boulton 1996; Kjær, 1999; Boulton et al. 2001, Kjær et al., 2003b). This recent attraction towards palaeo-ice streams is understandable since they have been identified as one of the most important controls on ice sheet configuration, stability and dispersal patterns of glacially transported material (Stokes and Clark 2001; Kjær et al. 2003b). Palaeo-ice steams are considered the arteries that drain ice sheets through channelized and steady fast flowing ice surrounded by areas of slow moving ice masses (Marshall et al. 1996). Therefore any useful reconstructions of former ice sheets must involve the location and timing of ice streams, especially for the marginal areas. In context of the last Scandinavian Ice Sheet, the dynamic behavior over its southwestern margin i.e. southern Norway and the Baltic region, seems to be strongly coupled to ice stream activity (Kjær et al. 2003b; Sejrup et al. 2003). The problem is, however, the lack of contemporary analogues for terrestrially based ice streams that might provide the necessary knowledge on processes, sediments and landforms associated with fast moving ice. Presently, diagnostic criteria for ice streams, such as landforms, are derived from ancient environments or from ice streams draining the West Antarctic Ice Sheet. Although this modern analogue is widely studied, Antarctic ice streams terminate in ice shelves or marine environments, making frontal situation difficult to study (Clark and Stokes 2001; Blankenship et al. 2001). Besides they are topographically confined by mountains, which channelized their flow and they have limited resemblance to the lowland glaciers that occupied many former glaciated areas with unconstrained flow conditions. A certain type of contemporary glaciers behaves ‘radical’ from what is normally considered the mode of operation for ice masses under the influence of gravitation. Ranging over a time-scale of a few years to centuries such surging glaciers experience major fluctuations in velocity. Usually surging glaciers operate in cycles divided into phases of active surging where ice is rapidly transferred towards the glacier snout, and quiescent intervals during which the glacier recovers and builds-up in the catchment area (Meier and Post 1969; Raymond 1987). No doubt, surging glaciers constitute an extreme situation when it comes to flow mechanism, basal conditions and the way glaciers in general interact with the climate system. Surging glaciers might also be perceived as ice where the flux is sufficient to reach a fast flow mode for a period, but insufficient to maintain it in such a mode (Budd 1975; Sharp 1988a). In contrast, ice streams are able to maintain high ice-velocities over a continuously period. Despite this difference, surging glaciers terminating on land provide an imprint of landforms and landform assemblages after fast ice flow that resembles the situation related to ice streams. Heavily crevassed surface of Brúarjökull in surge. Photo: S. Thorarinsson, 1964. The largest modern surges known to have occurred on the northern hemisphere are those of Brúarjökull. During the most recent surges in 1890 and 1964 an area of 1400 km2 of the glacier was affected and the glacier advanced 8-10 km onto the forefield (Thorarinsson 1969). By itself, Brúarjökull offers an exceptional opportunity to study processes, sediments and landforms related to a surging glacier. Furthermore, the scale and unconfined ice-flow conditions at which surges takes place at Brúarjökull makes it attractive to study as analogues for fast flowing glaciers in palaeo-glaciated regions e.g. Scandinavia and North America. The front of Brúatjökull in surge. Photo: S. Thorarinsson, 1964. Using the principle of actualism, the overall aim of the Brúarjökull project is directed towards the study of depositional environments at a contemporary surging glacier. This includes the development of glacial landscapes and associated sediments as a function of climate and glacio-dynamic changes. By this, we can obtain a substantiate understanding of glacial landscapes and sediments e.g. formed by palaeo-ice streams and surge-type glaciers in formerly glaciated lowland regions such as northern Europe and North America. The Brúarjökull project is unique: (1) It embraces all major glacial environments i.e. supraglacial, subglacial, ice marginal and proglacial environments; and (2) it is interdisciplinary as it embraces the interaction between climate-processes-sediments-landforms over time and space (chronology, stratigraphy) that involves glaciological, geomorphological, sedimentological and glacial geological disciplines. Low-angle thrust fault in the 1890 end moraine complex. Photo: Ó. Ingólfsson, 2004. The project is multidisciplinary with strong emphasis on interactions between climate-processes-sediments and landscapes in a glacial environment. It brings together disciplines from physical geography, glaciology and glacial geology that rarely are coordinated in a joint effort to develop a sedimentological model. Actually it is the first attempt to reconstruct a model for the internal architecture of a forefield associated with a fast flowing ice that might serve as reference work and inspiration for geomorphological and geological investigations in areas suspected to be influenced by palaeo-ice streams. The project at the Brúarjökull glacier will most certainly contribute with original and novel data, especially, climatically and glaciologically related sedimentological data that is limited from the marginal areas of modern surge-type glaciers. Highly original is also, the link between glaciological information and the sedimentary record of surges coupled to external parameters that might influence the dynamic behavior of the glacier. 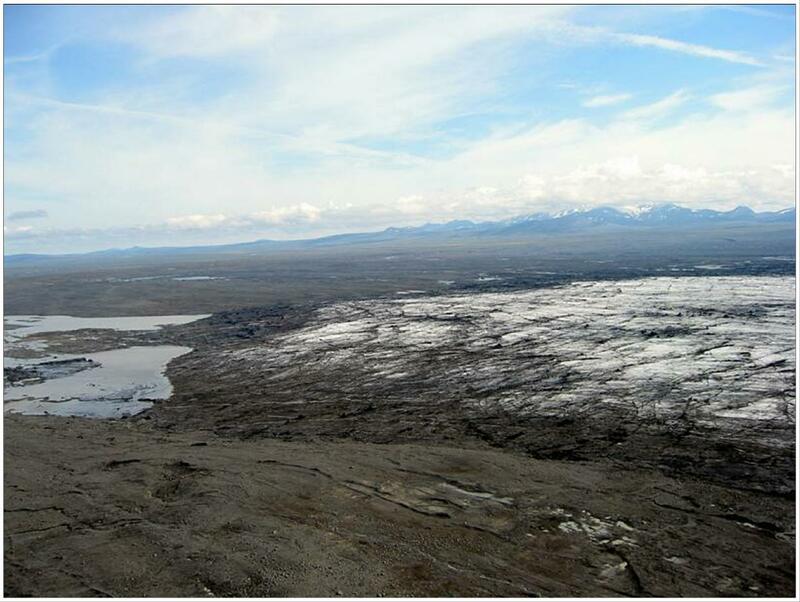 The experience from Mýrdalsjökull (as indicated by the Science Citation Index and standard textbooks) tell us that the results obtained from contemporary glaciers are highly relevant in the international scientific discussion on the development of glacial landscapes and its coupling to climate. The role of the North Atlantic Oscillation (NAO) and its coupling to North Atlantic climate in a shorter and longer time perspective is a ‘hot’ topic. The Brúarjökull project may help to resolve how NAO-like changes may be coupled to both recent surges and to the palaeo-ice streams of the last glaciation and deglaciation. There is every reason to emphasize that although glacier surges senso stricto are not considered to be triggered by climatic fluctuations, the concentration of surging glaciers in certain regions and systematic inter-regional variations in the length and duration of surge cycles strongly suggest that there is some link between surging behaviour and climatic inputs (Budd 1975; Benn & Evans 1998, pp. 170-175). Subglacial meltwater (to a large degree a variable related to summer temperatures and precipitation) plays an important role in controlling surges. Melting and downwasting of ice during the non-surging phase of surge cycle is climatically controlled, and plays a role in the overall behaviour of a surging glacier. Thus there are links between climate and surging glaciers. A complete theory explaining glacial surges remains elusive, and awaits an expansion of the observational database. The Brúarjökull project may contribute to that database, at least with regard to the connection between sediment-landscape development and climate during the quiescent (non-surging) phases of the Brúarjökull surging glacier. Automatic climate station, Brúarjökull and Kverkfjöll in background. Photo: K. Kjær, 2003. 1. On the Brúarjökull forefield, an automatic climate station was deployed in 2003, which continuously records air temperature and precipitation for the entire project period. 2. A reference system is being established in UTM coordinates, as basis for all other observations. 3. Three parallel transects were established perpendicular to the ice-margin from the outermost end-moraine (1890) to the present-day ice front ~6-8 km. These are positioned relatively close to each other and both in river valleys and on high-lying terrain. Along transects a lithostratigraphic model will be erected and the sedimentary units associated with different landforms will be described including: eskers, push-dump moraines, dead-ice moraines, fluted ground moraine, outwash sediments etc. This was the focus of fieldwork in 2004 and will be the focus in 2005. 4. Along the same transects, the depth to the bedrock will be mapped using the georader technique in order to establish the lower limit of the accumulation basin. This task was started in the 2004 field season, and complementary mapping will be done in 2005. 5. A new set of aerial photographs in scale 1:20.000 were recorded for the area covered by the transects. This work was contracted to Loftmyndir ehs, and the aerial survey was carried out in August 2003. It was financed by a separate Swedish grant. 6. Four terrain profiles were established in 2003 over ice-cored moraines with different ages for repeated measurements until 2005. Along these profiles, the sediment properties and thickness are recorded. For selected observation points the contribution of top and bottom melt is monitored on an annual basis. In ice-cliffs the structural appearance and debris content is documented. Work with this was done during the 2004 field season, and will be continued in 2005. 7. Within the dead-ice fields, the ice-disintegration processes: backwasting and downwasting will be registered, together with identification of major re-sedimentation processes. This was done during the 2004 field season, and will be continued during the 2005 field season. 8. In the dead-ice terrain, data-loggers were installed during the 2003 field season, to measure temperature and moisture content at different depths in the sediment cover to evaluate the relative significance of precipitation and air temperature for the de-icing progression of ice-cored moraines. Data will be collected until 2005. 9. In the more mature dead-ice moraines (from the 1890 glacial surge) the final re-sedimentation processes will be observed and linked to the sedimentary end-product. This will be achieved through surface mapping of processes and detailed descriptions of the deposits in geological and sedimentological sections. This was one focus of the 2004 field season, when some sections in the “Hraukar” end moraines were mapped for structural and sedimentological properties. This work will be continued during the 2005 field season. 10. At the glacier margin, annual frontal fluctuations and ice-velocity will be monitored throughout the research programme. Ice marginal sediments will be investigated, including the development of crevasse-squeese ridges, during the 2004 and 2005 field seasons. This work is the focus of the MSc study of Lilja Rún Bjarnadóttir. 11. Three types of lakes will be cored beyond the 1890 end-moraine: (i) a lake fed continuously by glacial material, (ii) a lake fed glacially only during surge events and (iii) a lake fed free from the influence of glacier meltwater. The lakes to be cored were selected during the 2003 field season. During the 2004 field season, three lakes of categories (ii) and (iii) above were cored. The coring equipment was a modified “Russian Peat Corer”, which easily penetrates through minerogenic sediments and tephras. The cores received were short, 1-2 m, but probably cover at least 250-500 years of sedimentation. The cores are now stored in the Lund University sediment core depository and await analyses to be carried out in the spring of 2005. The target lake for 2005 is Grágæsavatn, which falls within category (ii) above. The target lake for category (i) lake is Lögurinn-Lagarfljót. A pilot core will be retrieved during 2005, using a modified piston corer of the Nesje type (for description, see: Nesje, A. 1992: A piston corer for lacustrine and marine sediments. Arctic and Alpine Research 24, 257-259). 12. Remote sensing studies of satellite images and aerial photographs on drainage paths and ice-flow patterns will be matched with glaciological data, such as mass balance data. This work started in 2003 and continues through the data-analyses phase of the project. Maps based on remote sensing will be checked in the field every field season. Meltwater channel that carried water during the 1890 surge. Photo: K. Kjær, 2003. Associate professor Kurt H. Kjær (sedimentology, geomorphology, stratigraphy and glacial processes). K Kjær has research experience from Iceland (Mýrdalsjökull-area) and Northern Russia. Participation in all field seasons. Professor Svante Björck (sedimentology and processes in lakes, biostratigraphy). S Björck has wast research experience from East and South Greenland, Antarctica, Sweden, The Azores, Tristan Da Cunha and Iceland (Skagi, northern Iceland). Participation in the 2004 and 2005 field seasons. Professor Björck is one of the worlds most experienced scientists when it comes to working with lake sediments as climate proxies. Associate professor Per Möller (glacial stratigraphy, glacial landforms and sediments). P Möller has extensive research experience from Greenland, Svalbard, Siberia, Antarctica and Sweden. Participation in the 2004 field season. Anders Schomacker (glacial morphology and sedimentology, georadar). A PhD student at Lund University, financed by a research scholarship from Lund University. Participation in all field seasons. Professor Eiliv Larsen (stratigraphy and sedimentology). E Larsen has research experience from Norway and Northern Russia. Participation in the 2005 field season. Carita G. Knudsen (geomorphology, remote sensing). A Ph.D. student at University of Bergen, financed by a research scholarship from University of Bergen in collaboration with the project at Jæren. Participation in the 2003 and 2004 field seasons. Professor Johannes Krüger (geomorphology, sedimentology, glacial processes). J Krüger has wast field experience from Iceland (Mýrdalsjökull area), Denmark and Greenland. He will participate in all field seasons. Professor Ólafur Ingólfsson (glacial sedimentology and glacial stratigraphy). Has field experience from Iceland, Greenland, Svalbard, western Siberia and Antarctica. Participation in 2004 and 2005 field seasons. Ívar Örn Benediktsson (glacial geomorphology) is a PhD student at University of Iceland. Participation in all field seasons. Ívar Örn submitted his MSc thesis at University of Copenhagen in the spring of 2005. To read the thesis, click here. Lilja Rún Bjarnadóttir (glacial sedimentology, glacial geomorphology) MSc student at University of Iceland. She holds a Rannsóknarnámsstyrkur scholarship from Rannís for working within this project. Participation in the 2004 and 2005 field season. Professor Helgi Björnsson (glaciology) University of Iceland is a collaborator, and a link to the glaciological and climatological data base (glaciology, remote sensing). He will not participate in the field work. Guðrún Larssen, University of Iceland, collaborates with identification of tephra layers, and will not participate in the field work. Professor Jaap van der Meer (sedimentology, glacial processes, micromorphology of till deposts). Field experience from Svalbard, Greenland, Antarctica, Patagonia, Iceland and NW Europe. Professor van der Meer is a pioneer in developing the method of micromorphology. Participated in the 2004 fieldwork. Margin of Brúarjökull - view towards East. Photo: K. Kjær, 2003. This study is financed and supported in various ways by University of Lund (Sweden), Copenhagen University (Denmark), University of Bergen (Norway), University of Iceland, and the Geological Survey of Norway. Generous grants have been received from the Swedish Research Council (VR) and the Icelandic Research Council (Rannís). 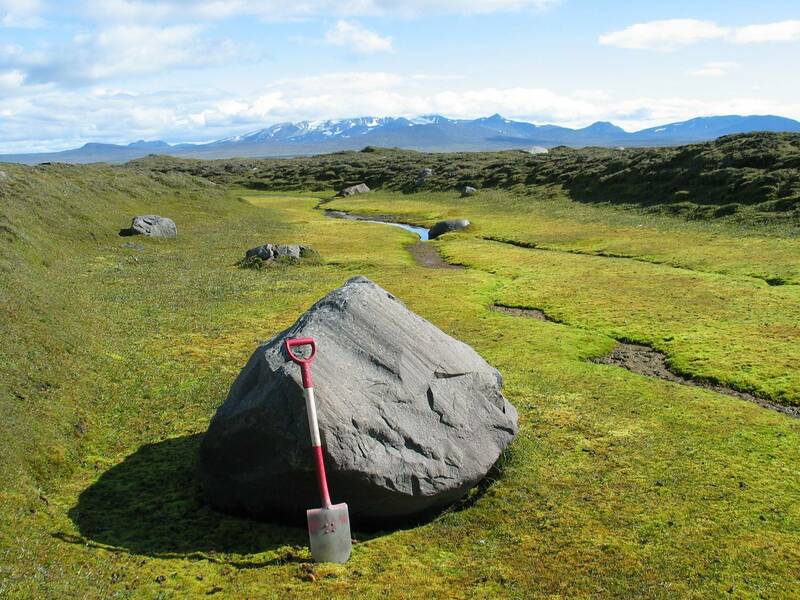 Landsvirkjun (Iceland) and the University of Iceland Research Fund have given grants to support the 2005 fieldwork. Mapping glaciotectonic thrust structures in the 1890 moraine complex. Photo: Ó. Ingólfsson, 2004. 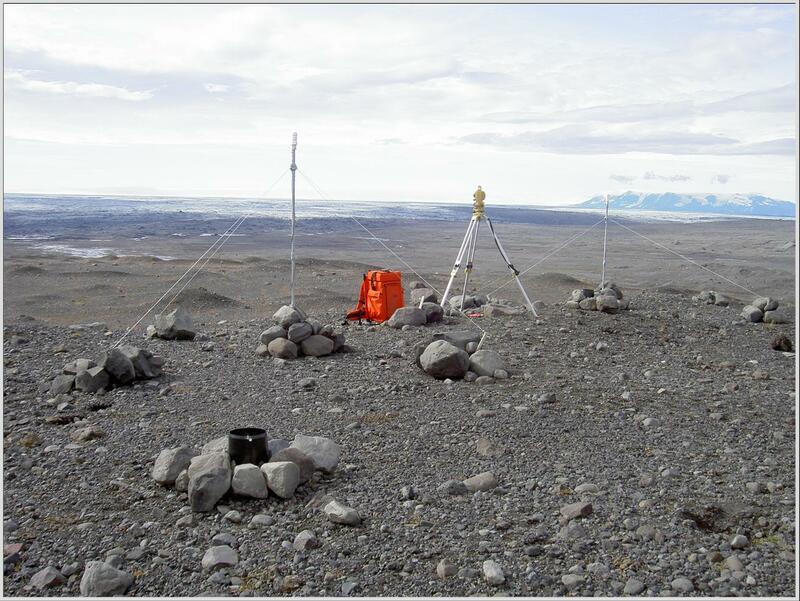 First stage, 2003: Reconnaissance of the field work area in the forefield of Brúarjökull (described above), setting up automatic climate station, preparing GPS-based coordinate system for mapping, obtaining aerial photos. Already completed. Third stage, 2005: First paper(s) on the glacial geology of the Brúarjökull forefield, focusing on geneses of landforms and sediments. Continued mapping in the field of sediments and landforms along the transects. Coring of two lakes (Grágæsavatn and Lögurinn). Data analyses and interpretations. Work with glaciological modelling. A workshop on Iceland is planned for the winter of 2005-2006. Checkpoints: Progress reports, manuscripts. Fourth stage, 2005-2006: MSc and PhD students graduate with their theses. Writing up of results with regards to the dynamics of sedimentary deposition and landscape developments in connection with surges, results of glaciological modelling and the identification of unique signatures of surging glaciers/ice streams in the geological record. Checkpoints: Progress report, PhD/MSc theses, manuscripts. Benn, I. & Evans, D.J.A. 1998: Glaciers and Glaciation. Arnold, London, 734 p.
Blankenship, D.D., Morse, D.L., Finn, C.A., Bell, R.E, Peters, M.E., Kempf, S.D., Hodge, S.M., Studinger, M., Behrendt, J.C. and Brozena, J.M. 2001. Antarctic Research Series 77, 105-121. Boulton, G.S., 1986. Nature 322, 18. Boulton, G.S., 1996. Journal of Glaciology 42, 43-62. Boulton, G.S., Dongelmans, P., Punkari, M. and Broadgate, M. 2001. Quaternary Science Reviews 20, 591-625. Boulton, G.S. and Hindmarsh, R.C.A., 1987. Journal of Geophysical Research 92, 9059-9082. Boyce, J., Eyles, N., 2000. Geological Society of America, Bulletin 112, 98-118. Clapperton, C.M. 1975. Journal of Glaciology 14, 395-406. Clarke, G.K.C., 1987. Journal of Geophysical Research 92, 9023-9036. Evans, D.J., Lemmen, D.S. and Rea, B.R. 1999. Journal of Quaternary Science 14, 673-691. Fischer, U.H. and Clarke, G.K.C., 2001. Quaternary International 86, 29-43. Hambrey, M.J. and Huddart, D. 1995. Journal of Quaternary Science 10, 313-326. Hoppe, G. 1953.Ymer 4, 241-265. Hart, J.K. and Rose, J. 2001. Quaternary International 86, 1-2. Houmark-Nielsen, M. 1987. Bulletin of the Geological Society of Denmark 36, 1-189. Kjær, K.H. 1999. Sedimentary Geology 128, 271-292. Kjær, K.H. and Krüger, J. 2001. Sedimentology 48, 935- 952. Kjær, K.H., Houmark-Nielsen, M. and Richardt, N. (2003a). Boreas 32, 130-148. Kjær, K.H., Krüger, J. and van der Meer, J.J.M. (2003b). Quaternary Science Reviews 22, 15-17. Knudsen, O. 1995. Quaternary Science Reviews 14, 487-493. Krüger, J., 1994. Folia Geographica Danica 21, 233 pp. Krüger, J., Kjær, K.H., and van der Meer, J.J.M. (in press). Norwegian Journal of Geography. pp. 21 ms.
Marshall, S.J., Clarke, G.K.C., Dyke A.S. and Fusher, D.A. 1996. Journal of Geophysical Research 101, 17827-17839. Meier, M.F. and Post, A.S. 1969. Canadian Journal of Earth Science 6, 807-819.
van der Meer, J.J.M., 1993. Quatarnary Science Reviews 12, 553-587. Raymond, C.F. 1987. Journal of Geophysical Research 92, 9121-9134. Sharp, M.J. 1985. Quaternary Research 24, 268-284. Sharp, M.J. 1988a. Progress in physical Geography 12, 349-370. Sharp, M.J. 1988b. Progress in Physical Geography 12, 533-559. Sejrup, H.P., Larsen, E., Haflidason, H., Berstad, I., Hjelstuen, B., Jonsdottir, H., King, E. L., Landvik, J., Longva, O., Nygård, A., Ottesen, D., Raunholm, S., Rise, L. & Stalsberg, K (2003). Boreas 32, 462-475. Stokes, C.R. & Clark, C.D. 2001. Quaternary Science Reviews 20, 1437-1457. Thorarinsson, S., 1940. Geografiska Annaler 22, 131-159. Thorarinsson, S., 1969. Canadian Journal of Earth Sciences 6, 875-882. Todtmann, E.M., 1952. Neues Jahrbuch f. Geologie u. Paläontologie. Monatshefte, 401-411. Todtmann, E.M., 1955. Jökull 5, 8-10. Todtmann, E.M., 1957. Neues Jahrbuch f. Geologie u. Paläontologie. Monatshefte, 316-326. Todtmann, E.M., 1960. Abhandlungen aus dem Gebiet der Auslandskunde, Band 65, Reihe C, Universität Hamburg, pp. 95.